Is B.C. 's booming craft beer industry fuelling addiction? What might set the craft beer scene apart is the idea that it is different, and that a passion for discussing the sophistication of hand-crafted beer exempts it from the addiction discussion. Alcohol addiction is everywhere. Those who suffer from the disease are on the streets, in pubs, at upscale restaurants and in homes. There's no question that B.C. 's booming craft beer industry has its fair share of addicts too. But what might set the craft beer scene apart is the idea that it is different, and that a passion for discussing the sophistication of hand-crafted beer exempts it from the addiction discussion. When I broached the issue of alcohol addiction within the craft beer community, about half the people with whom I spoke were quick to dismiss me. The argument was that craft beer and craft beer drinkers are different from those at your run-of-the mill watering hole because they're in it for the flavour, the sophistication and the craftsmanship. They're spending time in the tasting rooms, passionately discussing international bitterness units and flavour profiles, not just to get drunk. I had a number of people tell me -- full stop -- that alcoholism is not a problem in the craft beer industry. It felt like that level of denial about alcoholism I encountered in a community of people who are devoted to the consumption of alcohol might actually be what sets the craft beer industry apart when it comes to addiction. Dr. Launette Rieb, an addictions expert and a clinical associate professor in the faculty of medicine at the University of British Columbia, is quick to point out that about one in five Canadians will develop an alcohol use disorder in their lifetime. She says just because a substance is sophisticated, does not mean users are exempt from developing an addiction. "When terms like craft or artisan is applied to something like beer, what the marketing strategy there is to try to make it more appealing, or more acceptable to a broader population," Rieb said. "Anything that increases the acceptability of a substance increases use." A huge part of addiction comes down to the release of the chemical dopamine in the brain. And when it comes to the "geeking out" factor that is inherent to the craft beer industry, Rieb says that the intense pursuit of knowledge associated with a substance can exacerbate the possibility of addiction. "Anything that causes dopamine release and can cause addictive behaviour, can have pleasure associated with it as people think about the thing, or participate in using the thing," she said. "So it's not unusual for things to become fetishized in one way or another that cause dopamine release." Rieb says the upper limit of low-risk drinking guidelines is two drinks per day for women and three per day for men at a maximum of five days per week. 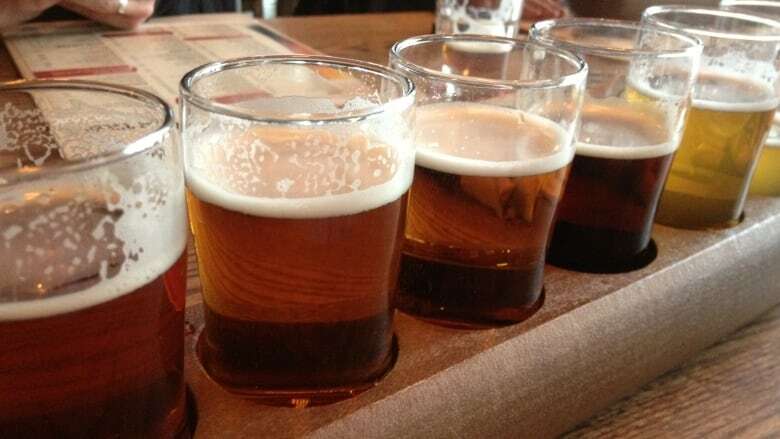 One drink is considered to be 341 ml of five per cent beer. Though many in the craft beer industry did not want to talk about addiction, some were willing to have an open discussion about the issue. Vancouver bartender Brendan Kiloh has worked at traditional pubs like The Wolf and Hound in Kitsilano, but now tends bar at the Red Truck Beer Company. Kiloh says it is different working at a craft brewery because there are fewer regulars and fewer people who stay for four or more drinks. Patrons who consume only beer are generally easier to manage, he says. Still, Kiloh has regulars who consume five or six drinks every day. "There are definitely cases where you can slightly veil your alcoholism by talking about hops, and IBUs, (international bitterness units) and malt profiles and things like that," he said. "Let's be honest, people consume beer for a variety of reasons, but one of those reasons, and it's a big one, is to get drunk." Chris Charron, head brewer and co-founder of The Steel Toad Brewery, says he takes the issue seriously. And the beer he brews can cause addiction just as easily as mass-produced beer. 'There's people who sit here drinking what is hand-crafted, craft beer and there are people with drinking problems here," Charron said. One obvious difference in drinking craft beer as opposed to the Molsons and Labatt's of the world is the alcohol content. Many of these beers contain seven to 10 per cent alcohol. John Hallett, a craft beer aficionado and blogger at BarleyMowat.com, has written about alcohol addiction in the craft beer industry in the past. He says craft beers have been getting stronger for years. He calls the phenomenon the "alcohol wars." What started out as replications of English pub ales with four or five per cent alcohol volumes, turned into five or six per cent alcohol volumes in India Pale Ales. What followed that was a march toward craft beers containing nine, 10, and 11 per cent alcohol. "I noticed people hadn't adapted their drinking habits," Hallet said. "They were still having a pint of these monster beers, which is absolutely not an appropriate serving size for a beverage of that strength." he said. Although many in the craft beer industry deflected my questions about addiction, some people are starting a conversation on the periphery of the culture. Based on some of the concerns from Dr. Launette Rieb, the UBC addictions expert, anything that makes a substance more acceptable, trendy or cool can result in increased risk of addiction. And for that reason, B.C. 's craft beer leaders might do well to bring the addiction conversation to the forefront if they hope to promote responsible and healthy consumption as the industry continues to boom.